Travel to beautiful Zion National Park where ancient native people and early pioneers traveled through this amazing landscape. Here you stand beneath soaring spires and gaze up at the massive sandstone cliffs. We can visit the Emerald Pools and marvel at the Hanging Gardens as you hike back to the Narrows where you wade through the Virgin River with towering cliffs above. You may take the hike to the famous Angel's Landing, one of the most picturesque views in the world if you dare. There are activities and hikes for any fitness level. 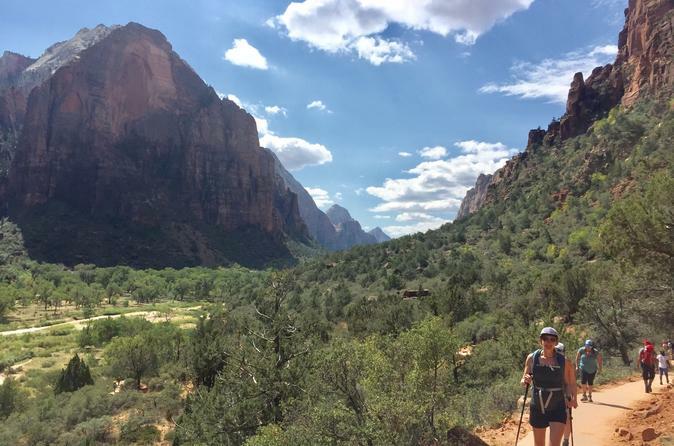 Zion is a rare wild place where you connect with nature and find a beautiful pristine wonder! We pick you up at your Las Vegas Hotel or location at 8:00 am and drive a scenic road through the Mojave desert and down through the picturesque Virgin River Gorge. We travel through St. George, Utah and then on into Zion, Utah's most famous National Park. Huge canyon walls and sandstone cliffs rise against the azure blue skies. You may hike one of the many trails that ascend the walls or travel along the river to the narrows. If you are ambitious, climb the narrow ridge to the incredible Angels Landing. In Spring through Summer months visitors must use a shuttle system provided by the National Parks system to enter the main Park area. We'll have lunch at the lodge at either the snack bar or the Red Rock Grill. We will leave Zion at approximately 4:00 pm for a 2 1/2 hour return to Las Vegas.